Have I mentioned that this was a busy week? Monday saw the release of our new Kindle game Panda Poet. Yesterday, we release not one game, but two games. The first is Steambirds for iOS. The second is Steambirds for Android. Indie legends Adam Saltsman and Eric Johnson from Semi-Secret handled the iPhone and iPad versions. They've been leveraging their experience with Canabalt and Gravity Hook to help navigate the wild west of AppStore relevancy. Check out that gorgeous new title screen...there are also all new plane graphics. You can pick up the iPhone version for 99 cents or you can splurge on the HD iPad version for $1.99. You are so totally worth it. Victor Chelaru from Flat Red Ball handled the Android version. They did some amazing work optimizing the UI to work on Android phones. The performance was tweaked until the whole experience feels smoother than the silky fine fur of a baby beaver's bottom. Try it and you'll see what I'm talking about. There is a limited launch promo price of 99 cents that only lasts till November 17th. Then it gets expensive. Long ago when I was first playing around with the Surface at Microsoft Research, I dreamt that one day in the far future I'd be able to play a game just like Steambirds. There is just something incredibly tactile about a big screen and those little chunky planes that just beg to be dragged about. The thought of it makes my fingertips vibrate. The touch friendly Steambirds UI plus the big screen on an iPad were meant for each other. Here are two very basic design lessons from this particular set of releases. Strive for simple interfaces. We often get caught up in adding buttons; new feature = new button. But my favorite designs are ones that start out feeling almost too simple. There are big benefits. Simple interfaces are easier to transfer to highly divergent platforms. Simple interfaces are also easier for new users to learn. There doesn't need to be a trade off; you can have both a simple interface and immense gameplay depth. This is probably the one design challenge that I obsess about more than any other: how do you create layers of depth in the player's mind, not in the user interface? It isn't the easiest problem to solve, but when you see it, you know you are in the presence of great design. If you've got gameplay magic, bottle it up and spread it wide and far. 10 million unique users have played Steambirds. The gameplay resonates quite broadly. The question is not 'which platform should I target? ', but instead "how do I reach as many customers as possible across all viable platforms?" Alright, I'm breathless. 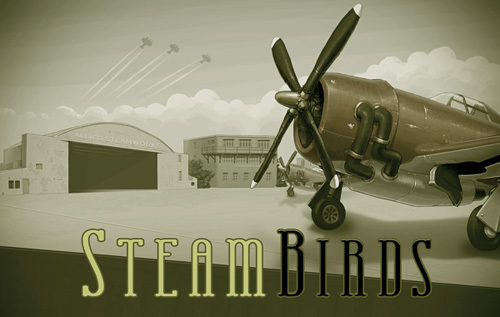 If you have an Android or iOS device, grab a copy of Steambirds and let me know what you think. Think of it as a vote for deep, great indie games on your phone. Thanks for the heads-up! Nothing like a hot new turn-based game in my pocket to make my day! I really like the way the game feels. It's almost like a drawing program, with the splines, but it has machine guns! The flash version was really really good so this is an instant buy for me. Turn based games are the only games I can play on the buss and there are few of them with the quality of SteamBirds. The screenshots in Market aren't looking so hot. A bit too high compression perhaps? Btw, would be nice with anti-aliasing and pinch-to-zoom support. Android version doesn't feel very well-ported. Not very androidy. Menu button takes you out of the game instead of bringing up a context-senstive android menu (like most apps...). there's no software way to turn off the music (which might be a good idea on a *phone* game). My fingers (which are not that pudgy!) have trouble hitting the thing they're trying to hit, and when they miss, something unintended happens. if that something is scrolling instead of moving my plane, that's OK (just a little annoying) but when I miss the "play" button to start a mission, for some reason the game decides I clicked on some other still-locked mission and informs me of this. then I have to exit out of that prompt, go back to the mission, and try again and hope I don't miss this time. It's still a good game, of course, but yeah. That out of the way, are there plans to allow the Android version to save to SD Card? It's possibly one of the best things for my (rather game heavy) phone. Is there a date planned for release on the French apple store ? Did you write the app natively in iOS and Android, or is this done using the Flash packagers for those platforms? And I second the request for the ability to move the app to the SD card. I don't understand why any game over just a few KB is released without that. Played the free flash version, liked it, got the android version, enjoyed it so far. Complaints listed above are fairly valid, the android menu takes you back to the game menu (back button should do that) no software volume control is annoying, I have to turn my whole phone on silent and then often forget to turn it back. Finally I'm worried about re-playability as I'm up to the last mission within about 4 hours of starting... Haven't looked at bonus missions yet though. 3) Once the plane gets close to the map it may not be controllable any more (the buttons are outside visible area). May need a "approaching boundary" warning. Sometimes zooming out may help, but not always. 4) Plane control is not that big of an issue as there's the "prev/next" plane button in the lower left. 5) Needs a help screen of some sort. Here's the strategy guide for Steambirds... Can't wait for the next version! I played it through on iphone and it's quite good. nicely done. Saw an intermittent bug (well, I couldn't isolate a repeatable process, so I'm calling it intermittent), where starting a level after the game has been sitting on the menu and in screen-off state, the level immediately fails, as though it was keeping some state from the last level played. If I can find a more repeatable process to get it to occur, I'll post something. Game is still very good though, this minor point aside. 1) Gauntlet mode: infinite waves of enemies, just to see how long you can last with enemies coming from all sides. 3) Something a bit more substantial than just # of stars and promotion. Maybe generate a particular code that allows people on a special bulletin board to display a special "badge"? I'm sure people have been pestering you with "mission editor", "ability to customize plane like RPG", and so on. As Kim said above, there is a bug on the Iphone was causes you to fail a mission seemingly at random when you press to confirm your moves, I failed the tutorial level twice because of this bug, planes where unharmed and at full health but I got the game over sign.